Educational and interactive reptile handling exhibition. Guaranteed hands-on activities and fun for all the family this Easter! The Reptile Academy Ltd is hosting our first 2019 Reptile Exhibition in Southampton which will open to the public at 10am and conclude by 5pm on Sunday 21st and Monday 22nd April 2019 at Lordshill Community Association, Southampton. The Reptile Academy works with several groups including Special Educational Needs Centres, Residential Homes as well as larger events such as Petersfield Festival. However, instead of being an attraction at an event, this Event is all about reptiles! There will be an array of reptiles in our Reptile Handling Zones as you walk through the Heart of Africa, explore the Giants of Asia and look high up into the Forests of Central America as well as much, much more! *Some high-demand activities may be on a first come first serve basis throughout the day for example snake-modelling photo shoots and face painting as well as additional side hall events. Snake-modelling photoshoot experiences are FREE and include digital e-photos however prints incur an additional fee of £10 per print on the day. All photos are taken at a professional standard. Pre-book VIP Burmese Python and Boa Constrictor mini-photoshoots at the end of the booking process to avoid disappointment due to high demand. Taking pictures is most welcome as long as you share your photos online but please, no flash photography. In addition to the animal handling attractions, snake-modelling photography will be taking place where you will get the opportunity to have a FREE, mini photo shoot with FREE digital E-photos (via email). Photography sessions by our professional photographers will be running throughout the day featuring various reptiles at different times. The Exhibition will also have other displays and activities including sculptures, fossils & skeletons, VR headsets and much, much more to appeal to all audiences; children, students and adults. In addition to the main event hall, a second hall will have specific activities running throughout the day. 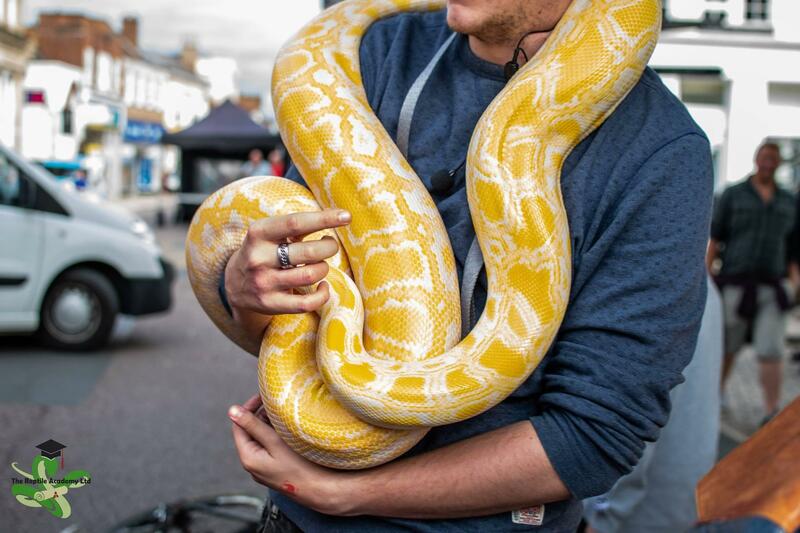 There will be a Reptile Fun Zone Session for children, Educational Seminars designed for students, a Reptile Catwalk to promote awareness about the impact the fashion industry has on reptiles and conservation as well as other short talks throughout the day. Each activity in this smaller hall will be limited to 60 guests where you can reserve a place at the end of the booking process or attend on a first-come, first-served basis. More details regarding these workshops and seminars will be announced soon! We will providing subsidised food and drink options to all guests on the day including teas, coffees, canned and bottled drinks, burgers, hot dogs, sandwiches and rolls with vegetarian options. There is the option to pre-order your food options on the sundries list at the end of the booking process. Unlike many Reptile Exhibitions, this event focuses on fun, interactive animal handling and education. It is a policy of The Reptile Academy Ltd to not promote or allow the selling of animals in the pet trade at our events. There will be no selling or promoting of the pet trade at this event. Instead we will promote responsible reptile husbandry, raise awareness about conservation and be happy to provide advice about rescuing reptiles.